I love aloo methi for it's flavor....perfect wid roti's..
love aloo methi, it is a very delicious dish and an all time favourite, wishing you and your family a very happy new year, and a fruitful one too..
Wow..Yummy side for rotis...!! Looks very inviting da! 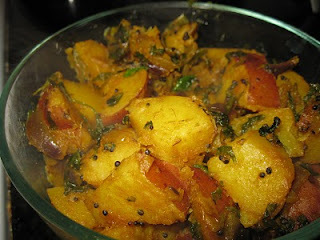 North Indian sabzis like this one do not call for mustard seeds, only jeera is used. Adding mustard seeds to every curry is so typically the South-Indian way of doing it!